Artist alley was my point of focus for the show. 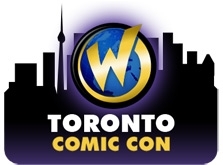 This year Wizard again failed to have any A list comic creators in attendance; no doubt having the event the same weekend as C2E2 didn’t help at all. The big names were Phil Jimenez, Yanick Paquette, Mark Texeira, Mitch Breitweiser and Jesus Merino: these are solid creators putting out excellent work but the show needs someone a little more high profile like Carlos Pacheco who was initially scheduled but later canceled. Francis Manapul is a great Toronto creator and appears at every show, as does Dale Keown and Leonard Kirk. Mike Grell, Michael Golden and Greg Horn were there as well but they haven’t had regular comic work out in years. Originally published under my Bound Together column at Comic Book Daily.